Buc Days introduces Parade Pachanga, a new addition to this year’s festival May 2-12. For the first time, the Navy Army Night Parade will begin in the American Bank Center, where it will run through the exhibit hall for up-close VIP parade viewing, then march out onto Chaparrel Street. Parade Pachanga also includes complimentary food and cocktails, live music, and a Kids Zone. The May 4 event is 7 p.m. to midnight. The party starts at 7 p.m. with complimentary food and cocktails. The parade begins at 8 p.m. with music, percussion, and lights provided by Grammy nominee El Dusty. Once the parade hits the street, local band Scarecrow People picks up the tempo inside the events center, performing until midnight. Buc Days kicks off with Rodeo Corpus Christi on April 25-28. Concerts follow each of the four nights of professional rodeo, all in the American Bank Center. Enjoy the Kids Corral Interactive Zone on Resaca Street just outside the arena before the rodeo begins. The zone opens at 3 p.m. Thursday, Friday, and Saturday and 1 p.m. Sunday with mutton bustin’, barrel racing, and a mechanical bull. The Buckin’ Marlin Stage presents free live music from local musicians each evening outside the arena before and after the rodeo. The nightly concert, which requires tickets, is inside the venue. The Buc Days Stripes Carnival sets up May 2 and doesn’t stop with its nightly lineup of live music, pirate acts, amusements, and rides until May 12. The fun kicks off at 6 p.m. Thursday, May 2, with the Dunking of the Mayor. Pirates capture the city’s mayor (or his stand-in) and make him walk the plank into Corpus Christi Bay, claiming official control of the city for the next 10 days. Best place to watch is from the Lawrence Street T-Head. For prices on all-you-can-ride wristbands, performance schedules, and more, visit the bucdays.com website. Buc Days has two parades. 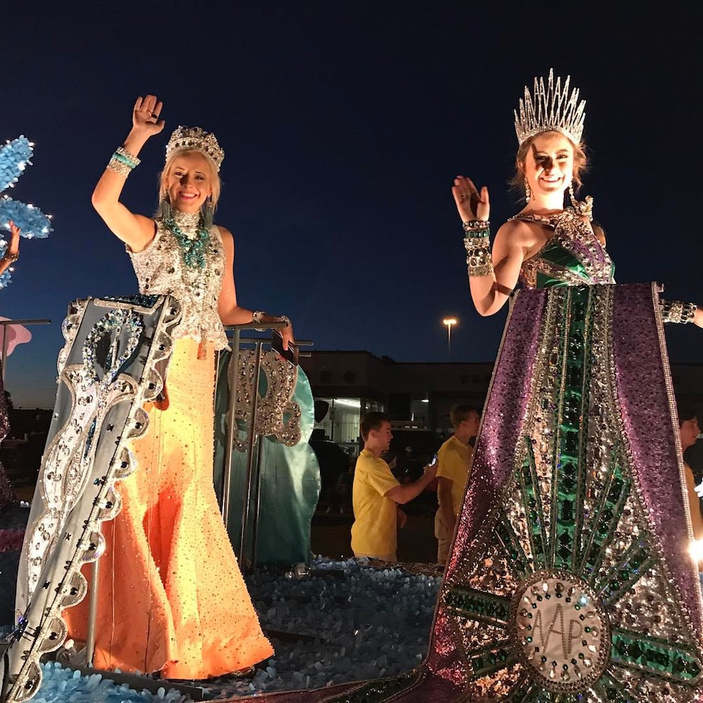 The Navy Army Night Parade on May 4 marks a beginning to the festival, while the Junior Parade acts as a fun and festive bookend on Saturday, May 11. The parade begins at 11 a.m. at Main Street and North Shoreline Boulevard, ending at the carnival site next to McCaughan Park. For a full schedule, visit the bucdays.org or find individual events online at 101CorpusChristi.com/EVENTS. You can download details directly to your digital calendar, email them to anyone, and make a phone call or get directions with the touch of a finger.